A great location, close to skytrain, only 3 stops from city centre and walking distance to VGH and Cancer clinic. Beautiful outdoor patios to relax in the summer. Our room was rather small but serviceable, with a private bathroom. There was a communal kitchen, also a washer and dryer for laundry. The staff were very friendly and helpful. No coffee maker in the room so bring some coffee grounds to make your own in the kitchen. Very casual place - not at all upscale. We loved being able to interact with the other visitors and the cats. Room tip: the basement room was great in the summer as it stayed cool. The price you found is 13% lower than this hotel's average rate of $334/night. The price you found is 28% lower than this hotel's average rate of $299/night. The price you found is 28% lower than this hotel's average rate of $522/night. The price you found is 16% lower than this hotel's average rate of $389/night. The price you found is 11% lower than this hotel's average rate of $387/night. The price you found is 19% lower than this hotel's average rate of $421/night. Our stay here didn't get off to a great start. We were meant to stay in the 'attic room' - we knew it didn't have a door but thought it would be fine as it was an attic room and would still be private regardless. This is not the case! Complete false advertising because it is just a mezzanine level in the middle of a common kitchen area. We for sure would have been woken up by people turning the kitchen light on, going to the toilet etc. There was also no mention anywhere when I booked our stay that there would be cats roaming around, and as someone with severe asthma and a cat allergy I was really struggling. We asked to be moved to an actual room in the basement which we had the privilege of paying $50 more for, but we were so glad to get into a private room away from the cats it didn't matter! This room was obviously better however it was unclean, the bathroom had footprints all over it, the bed sheets smelled awful, I even found an old bottle of lube in the bedside cabinet. Just a disgrace. To top it all off the mattress must have been completely ancient, it was just awful and it dipped in the middle so I had to cling onto the side of the bed or I would roll into the middle. I woke up with terrible neck and back ache. We didn't even bother with the 'takeaway breakfast' - Costco bread and a jar of peanut butter no thank you. I would encourage all visitors thinking of staying here not to. 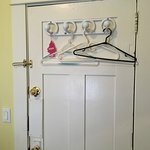 I have never felt more uncomfortable at a guest house before - and we previously stayed at a budget hotel on East Hastings!! I had a delayed flight and needed a place to spend the night close to hospital; I booked the room through Hotels.com but should have checked the reviews on this place first; the cat spray smell should have been first clue; I then experienced severe allergic reaction and respiratory distress, forcing me to leave; out of curiosity I searched reviews on the place and discovered several other similar complaints. To add insult to injury they refused to offer any compensation! Located in central Vancouver, close to the hospital and within walking distance of restaurants and shopping. Our prepaid reservation was for four nights. After 12 hours travelling we arrived a 2:00pm on a Wednesday – check-in is not until 3:00pm; we were told to return then. We sat in their beautiful gardens for the next hour. Our room was M1 in building 387. Rooms are reasonably priced for Vancouver this time of year. This house was once a stately old Vancouver home, which has been very inexpensively renovated to accommodate as many guests as possible. Our small room shared a bathroom and kitchen, both of which could use some updating (a employee should be tasked with straightening the kitchen daily). Be aware, walls are paper-thin. Our room was sparse, no cupboard (use back of door), no cups, drinking glasses, tissues and none in the kitchen either. 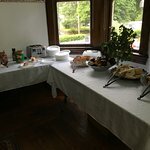 Breakfast buffet consists of a coffee/tea table and a food table made up of a bowl of soft boiled eggs, plate of muffins, plate of bagels and English muffins, jar of peanut butter (with knife) and a jar of jam (with spoon) and a toaster. Sign recommends it is a “breakfast to go”…no seating except outside (hope it doesn’t rain) or take back to your room. Had we been able to find another accommodation for less than $400/night in the general area (no vacancies), we would have walked away from our ‘non-refundable’ stay at Manor Guest House. The old adage holds true – you get what you pay for! Room tip: Don't stay here! We walked into the manor and opened the front door, creaky and eery. No one was around and we stood awkwardly for a minute or two calling out "hello" with no one there to welcome us. The host or owner or whatever he was (didn't introduce himself to us or tell us what his role was at all) popped out and asked for the booking name then disappeared to get it. It's ironic they advertise "We speak your language!" when we could barely understand what was going on for the first 5 minutes. I am an immigrant and I understand that English is not everyone's first language but I was shocked. We could barely understand each other. Nevertheless he continued upstairs to show us our "bedroom". As we were halfway through to reaching the second floor there was a stank and strong stench of heated grease flowing throughout to the point where I almost gagged and had to cover my nose. We reached the third floor and saw another tenant cooking in the very small kitchen to where the smell was probably coming from. The host shows us the shared washroom which is in a disgusting and unclean, completely unacceptable state. My boyfriend and I still await to be shown our "loft bedroom" and the host smiles and laughs awkwardly. We take a step back and there is a ladder right beside the kitchen counter with maybe 10 or so steps to an overhead floor maybe 4-5 ft below the ceiling. That is also in the centre of the entire third floor facing the staircase. Very uneasily, he said this was our "loft" and was not at all surprised at our consequent outrage. Immediately the host offered to be upgraded to a room for another whopping $30. This meant we would be paying $80 to stay in another room in this old house where the service is confusing, dishonest, and frankly very unsettling. Obviously, staying in this "loft" was not an option as everyone would be able to see, hear, and even approach us throughout the night. We would both sleep with no sense of peace. He kept on repeating he didn't understand while we complained about how there is no way we were staying in this room and overall the house after this surprise. He kept saying "email, email, email" and "no refund" to whatever we said to him. His wife yelled up at him in their language and then they both proceeded to yell to us "email and no refund" for the remained of the time we spent there. We checked the confirmation email sent by booking.com after booking the loft to see if it ever clarified the state of the "loft". It did but also after booking there is no way to cancel and no way to ever receive your money back so that "considerate" message explaining you'd essentially be sleeping on a total stranger's couch surrounded by other total strangers for $50 was completely useless. Of course a loft was expected but the level to which was presented towards us was horrendous. I was absolutely not okay with upgrading to another room and paying more towards their ridiculous plot and in fact after the whole ordeal I checked reviews online for the "loft" and EVERY one has upgraded because they had no other option. We decided to stay elsewhere and were lucky to have sorted but we have not (and will not) receive a refund from the manor for not staying there. I felt extremely insulted and the principles proven by the distasteful actions of the manor have ensured I will never ever recommend this place or head back there ever again. We are sorry that you were unhappy about what experienced, for the room loft, we already clearly mentioned the room description in the booking.com system, and we have 2 price for this room, summer promotion(NON-refundable) and standard price (refundable), The one that you selected is non-refundable, we clearly mentioned the room description and the refund policy in booking.com system, which you can clearly see before you make the reservation. This is a very unusual guest house. I arrived at the front door of what I thought was the guest house only to find the main door wide open, guests coming and going and no host to greet me. I had to be directed by other guests to the house next door before I was found my hostess. Soon I discovered that in fact the accommodation encompasses two historical homes that are joined together by the common garden. I rented Room #2, the King Suite, in Building 387 and a review of that room epitomizes my view of the guest house. In the past, Room #2 clearly was the dining room of a grand home: the hardwood floors, the wood trim, the rug, the beautiful sideboard. You can imagine the family sitting down to dinner, with servants serving from the adjoining butler's pantry. Though putting a king-sized bed in the room is a bit jarring to the eye, it actually works. Huge room, with a lovely view of the side garden. Yet attached is a private bathroom with little quality noted - rough plumbing and finishing work throughout. And little to any amenities in the room - e.g. couldn't get the TV to work and no available coffee/tea setup, even though the room was just by the butler's pantry. What ever renovations were done to make the room work as overnight accommodation appear to have been done cheaply with little care to maintain the character of the room or of the home itself. Breakfast was fresh but very basic and served on paper plates. There was no place to sit for breakfast (too many people attending at one time) so I ate under a tree in the garden in the rain. After considering my own experience and reviewing the Manor's webpage and previous reviews online, I assume these beautiful properties were purchased for the sole purpose of subdividing and renovating as cheaply as possible to accommodate as many people as possible. Yet here is my review dilemma - despite these drawbacks, the place had its own unique charm. The houses are in a lovely neighbourhood and within easy access of downtown. Free parking is available in the front of the homes (though I suggest advertising 9 available spots is a little generous). Room #2 was very clean. The international makeup of my fellow guests was stimulating. And for many, this could be the only experience to stay in such an historic setting, in part due to the lower accommodation charge. And that standing in the rain eating my breakfast had its own charm. I have seen other homes of this historic quality renovated to accommodate visitors but such renovations were done with love and care for the past, present and future of the house. Such is not the case here. 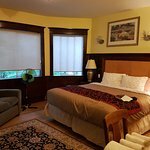 So, even though the Manor Guest House provides a unique experience at an affordable price (for Vancouver), I still think with sadness of what has been lost and what could have been. We are happy that you enjoyed your stay here at manor guest house. Thank you for choosing us! We appreciate your feedback. We look forward to welcoming you again.